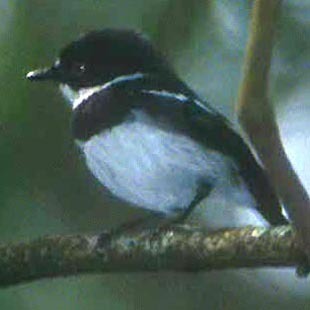 The Platysteiridae is a medium-sized African family of smallish 'flycatcher-like' birds of forest and woodland. Well over half the family are dapper little birds in the genus Batis, and called batises. Males tend to be black and white, with a black breastband. Females are similar but often have rufous below rather than a breastband. There is debate about species limits, with authors naming somewhere between 15-19 species. Shown here (below left) is an inquisitive female Pririt Batis, a bird of arid thornscrub in southwestern Africa. 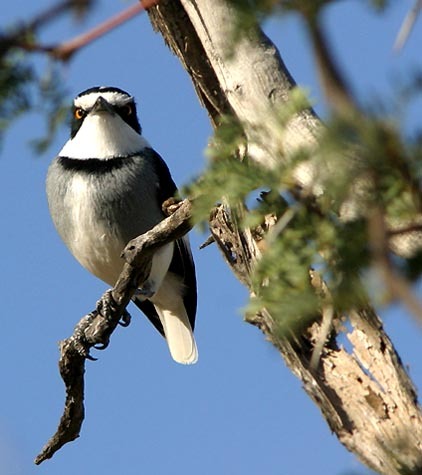 The male (below right) is a typical black-and-white batis with a gray crown and back. Male batises give a series of repeated short whistles, sometimes interspersed with harsh reply notes from the female. It is the male's whistles that often help one find these active small birds, often up in the canopy and constantly on the move. I've found them quite a challenge to photograph. Among the various species they occur in a wide range of wooded habitats. Sometimes a number of species split up forested niches, with several species found at the same locale. This presents identification problems in places like Gabon; I found Sargeant (1993), and his sketches, very useful there at a time there was no applicable field guide. Here are two more batises, both males, showing some of their range of variations. 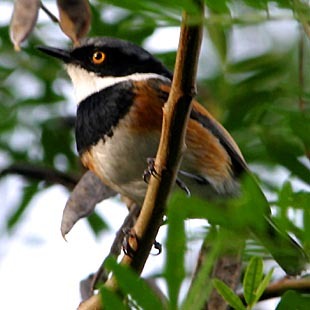 Cape Batis (below left) has a wide range in open woods of southern Africa. Note that it, unlike most male batises, has a rufous wash to the flanks and upperwing covers. In contrast, Rwenzori Batis (below right) has an extremely limited range in the undergrowth of montane cloud forest of the Albertine Rift. 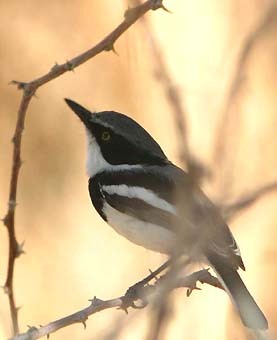 It is a very black-and-white batis (and is not often photographed). Female batises typically have a rusty or rufous breastband, as shown here by a Pygmy Batis (right), a very small species of arid thornscrub savanna in northeast Africa from Kenya to Ethiopia. There is a long history of taxonomic uncertainty about which birds belong in this family, or even if the family should be recognized. Harris & Franklin (2000), for example, seem to merge all these species into a large Bush-Shrike family [Malaconotidae]; so did Sibley & Ahlquist (1990) and Sibley & Monroe (1990), who also merged the helmet-shrikes and vangas as well. Dowsett & Dowsett-Lemaire (1993) lumps the helmet-shrikes and bush-shrikes with the world's regular shrikes in the Laniidae, but separates out the vangas, and places the wattle-eyes some distance away near the monarch-flycatchers! Sadly, it appears that the Handbook of the World series may follow that mistaken path. Like batises, White-tailed Shrikes have distinctive whistles, but dueting between the male and female of each pair is well established. The male has a courtship flight which starts with a steep climb upward followed by a series of short, jerky glides. The long legs (probably an adaptation for viewing surroundings in its rocky habitat) and short tail have confused its relationships with other birds, and accounts for the name "shrike" (the name "White-tailed Shrike" is a very poor choice, in my view). Even its Latin genus, Lanioturdus, illustrates confusions: "Lanio" for "shrike" and "turdus" for large thrush (Turdus is the genus of American Robin). The final group of birds in this family are the two genera of wattle-eyes. Both genera have fleshy, colorful wattles above their eyes, but those in genus Platysteira have long tails and forage at all levels in the canopy. The most widespread is Brown-throated Wattle-eye (left), named for the the throat color of the female, not the male (shown here). Banded Wattle-eye P. laticincta is rare and little known, and confined to the Bamenda Highlands of western Cameroon. The final group are six species of Dyaphorophyia wattle-eyes: White-spotted D. tonsa, Chestnut D. castanea, Red-cheeked D. blissetti, Jameson's D. jamesoni, Black-necked D. chalybea, and Yellow-bellied D. concreta. There is substantial debate about species limits in this group, with a number of authors lumping Red-cheeked and Jameson's, both little known birds, with Black-necked Wattle-eye. These little wattle-eyes are very small, almost tail-less, and impossibly cute little birds. They forage quietly in the thick undergrowth of west and central African rainforest. Most species have big eye-wattles surrounding the dark eye in glowing shades of green or blue; many are patterned with rich chestnut or yellow in addition to black and white. I was totally blown away by the first two of these undergrowth wattle-eyes that I saw in Kakamega Forest in w. Kenya way back in 1981 (Jameson's and Yellow-bellied). Of Yellow-bellied I wrote in my notes this it was a "magnificent, neon-yellow, silly little bird." Photos: Both the female and the male Pririt Batis Batis pririt were photographed at Spitzkoppe, n.w. Namibia, on 17 July 2005. The Cape Batis Batis capensis was in Kirstenbosch Gardens, Cape Town, South Africa, on 3 July 2005. The Rwenzori Batis B. diops was Ruhiza in Bwindi-Impenetrable Forest Park, Uganda, on 18 July 2002. The Pygmy Batis B. perkeo was in Samburu NP, Kenya, on 13 Nov 1981. 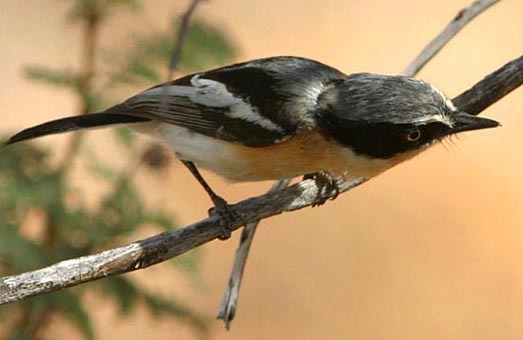 The White-tailed Shrike Lanioturdus torquatus was at Spitzkoppe, n.w. Namibia, on 17 July 2005. 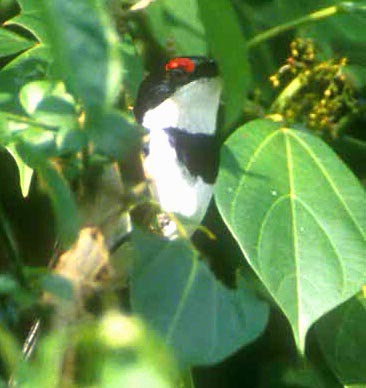 The Brown-throated Wattle-eye Platysteira cyanea was in Bwindi-Impenetrable Forest Park, Uganda, on 19 July 2002 . All photos © 2005 Don Roberson; all rights reserved. Harris, T., and K. Franklin. 2000. Shrikes & Bush-Shrikes. Princeton Univ. Press, Princeton, N.J. This is a very attractive offering in the Princeton bird families series. Tony Harris wrote the text; Kim Franklin did the plates. It has the familiar layout of plates altogether in the front, with range maps and i.d. summary, and detailed species accounts in the back. It looks well researched and has a good bibliography. I very much enjoyed the full-page spreads, with black-and-white sketch, on each genus in the groups covered, that highlights the introduction. There is a lot of discussion of taxonomy but, unfortunately, the authors chose to follow the Sibley & Monroe (1990) approach of only two families: shrikes [Laniidae] and bush-shrikes [Malaconotidae]. 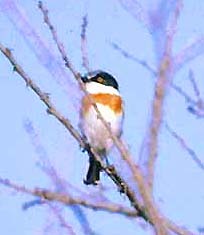 All of the batises, wattle-eyes, helmet shrikes, and such things as flycatcher-shrikes, wood-shrikes, and philentomas, are thrown into the latter family. New research does not support this approach. As it turns out, the true shrikes are not the closest relatives to the rest of this set (e.g., Barker et al. 2004), so even the premise of this book proves false. Further, vangas (not included in this book) are closely related to the rest of the group. Indeed, it appears that the flycatcher-shrikes are vangas, and that helmet-shrikes are very closely related to vangas. The text also suffers from the author's use of the "Species Recognation Concept" as his definition for species; fortunately, in practice, in works rather like the tried-and-true "Biological Species Concept." Yet both in its language and in its reliance on DNA hybridization evidence (Sibley & Ahlquist 1990), this book has the unfortunate status of being out-of-date taxonomically much more quickly than would be anticipated. That having been said, the species accounts, maps, and paintings for the species that are included all are very good. This is a well-written book with attractive paintings. It is great to have a world overview of the species that are included, even if they do not hang together as a group. One major annoyance: citations in the text are small-print superscript numbers. A list of these numbers is in the back of the book, but the list does not give the full citation. Rather, citation number 732 is "Emlen 1979." One then has to go check the bibliography to locate the full citation to Emlen's note in Scopus on fiscal shrikes. This is an entirely unnecessary double effort for the reader, and should have been fixed by the publisher (just number the bibliography if you use this tactic; see Dickinson 2003 for an example of the proper way to do this). Despite all these criticisms, it IS a very attractive publication and quite useful in many ways. So I give it 4 (of 5) stars despite its limitations. The basic, underlying information about each taxa, and the attractive plates, make up for a lot. Barker, F.K., A. Cibois, P. Schikler, J. Feinstein, and J. Cracraft. 2004. Phylogeny and diversification of the largest avian radiation. Proc. Nat. Acad. Sci. 101: 11040-11045. Beresford, P., F.K. Barker, P.G. Ryan, and T.M. Crowe. 2005. African endemics span the tree of songbirds (Passeri): molecular systematics of several evolutionary 'enigmas'. Proc. R. Soc. B 272: 849-858. Cibois, A., E. Pasquet, and T.S. Schulenberg. 1999. Molecular systematics of the Malagasy babblers (Timaliidae) and Warblers (Sylviidae), based on cytochrome b and 16S rRNA sequences. Molecular Phylogenetics & Evolution 3: 581-595. Cibois, A., B. Slikas, T.S. Schulenberg, and E. Pasquet. 2001. An endemic radiation of Malagasy songbirds is revealed by mitochondrial DNA sequence data. Evolution 55: 1198-1206. Dickinson, E.C., ed. 2003. The Howard & Moore Complete Checklist of the Birds of the World. 3d ed. Princeton Univ. Press, Princeton, N.J.
Dowsett, R. J., and F. Dowsett-Lemaire. 1993. "Comments on the taxonomy of some Afrotropical bird species," pp. 232-389 in A Contribution to the Distribution and Taxonomy of Afrotropical and Malagasy Birds (R. J. Dowsett & F. Dowsett-Lemaire, eds.). Tauraco Res. Rpt. 5. Tauraco Press, Liége. Fuchs, J., R.C.K. Bowie, J. Fjeldsa, and E. Pasquet. 2004. Phylogenetic relationships of the African bush-shrikes and helmet-shrikes (Passeriformes: Malaconotidae). Mol. Phyl. Evol. 33: 428-439. Sargeant, D. 1993. A Birders Guide to Gabon, West Africa. Privately published by D. E. Sargeant. Schulenberg, T.S. 2003. "The Radiations of Passerine Birds of Madagascar," pp. 1130-1134 in S.M. Goodman & J.P. Benstead (eds.) The Natural History of Madagascar. Sibley, C. G., and J. E. Ahlquist. 1990. Phylogeny and Classification of Birds: A Study in Molecular Evolution. Yale Univ. Press, New Haven, CT.